Earn 6110 points upon purchasing this product. The FW25 dual hydrostatic walk-behind packs the professional features of our FW35 model in a narrower package. With easy-to-use controls, electric start and a top ground speed of 9,6 km/h, it’s all your crew needs to breeze through lawn jobs with little effort. Heavy-duty construction and large, 20” tyres paired with a commercial-grade transmission make the FW25 truly perform on those long work days. Use 751500 points to purchase this product! Adjust the mower’s speed without removing your hands from the control handles with the improved, ready-access cruise control bar. Simply press forward to increase speed and pull back a slow down. A convenient speed indicator is placed within easy view on the control panel. The CC™ Centralized Control lawn mower handle design places the operator’s hands in the ideal position to access all in-demand controls. 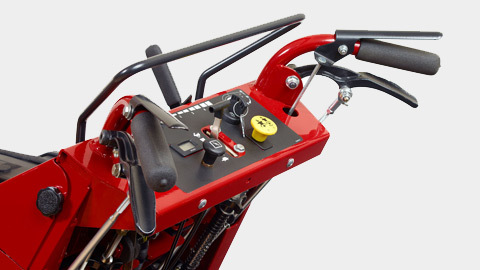 Ergonomic operator presence, steering and reverse levers on both handles operate with a light touch to reduct operator fatigue. 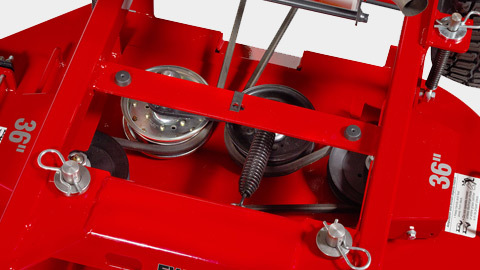 Easily adjust control tensions to fine tune for different operating conditions. Need to walk away from the mower to move an obstacle or debris? 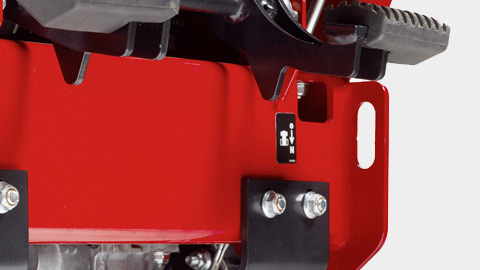 The new PTO switch allows the operator to stop the mower blades quickly and easily. While mowing, simply step on the centralized foot activated neutral pedals or pull back on the cruise control bar to place in neutral. Then, remove your hands from the controls. The blades will stop while the engine continues to run. Restarting the blades is just as easy. Place your hand on the controls, pull up the PTO switch and set your speed with the cruise control bar. New dual access neutral pedals take the guesswork out of finding neutral, simplifying operation and saving time. 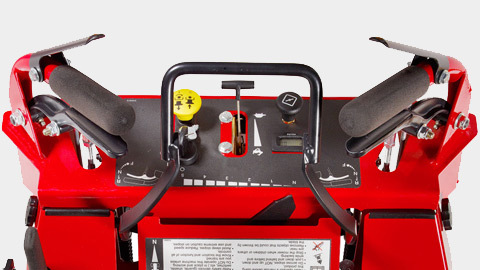 The operator can use either foot to put the mower in neutral. The neutral position is clearly identified on the speed indicator on the dash. 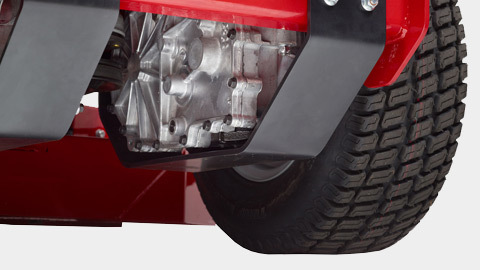 Thick, 1/4″ steel guards protect the front deck mower’s transmission when going over curbs or rolling on and off a trailer – the type of rough handling that occurs daily under commercial use and can render lesser mowers inoperable. The design also reduces build up of debris to improve air flow and allow for access to the filter for maintenance. 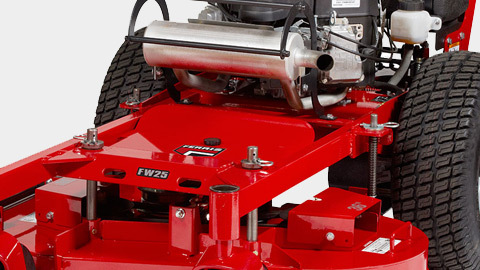 We listened closely to our pro users when considering the enhancements on our redesigned mower deck. 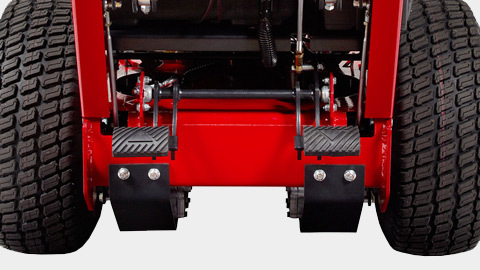 The new mounting system provides easier deck leveling, improved flexibility over terrain, easy-access grease points and more durable wear points for reduced maintenance. 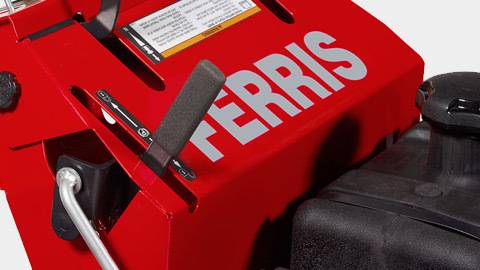 Ferris makes choosing mowers a no brainer. The parts that wear out the soonest don’t have to go so soon. 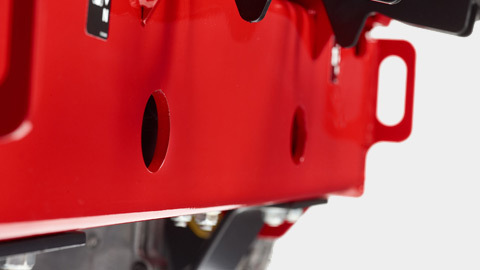 The Ferris-engineered deck drive belt system and larger pulleys provide gentler belt tension, which – combined with our unique debris shield – extends belt life and reduces wear on bearings. We located the parking brake handle conveniently in front of the control panel, providing instant access with minimal operator effort to reach and engage. 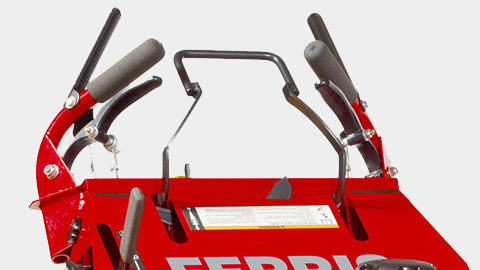 All Ferris walk-behind mowers are ruggedly built nose to tail to withstand daily commercial-duty operation and transport. Robust 1/4″ steel engine deck construction stands the test of time. Dedicated tie-down points located in the front and the rear makes trailering this commercial lawn mower between jobs secure and easy.